Others will have different opinions but this is the way I saw things. I genuinely liked everyone on the trip and had many long and interesting discussions with everyone. Anything I write about anyone is purely in fun. If I have made any mistakes please tell me. For Peter and Angie, this was their maiden voyage with Outback Spirit with a brand new vehicle. Consequently, a few things did not go as they intended but this did not spoil anything. All the photos have been reduced in size (and subsequently quality) for faster downloading. Unusually, I could not find any people that had the same job category. On a previous trip I found 4 ex teachers. I did not get the fuel consumption for all the trip but for one long section it was 32 litres/100km. I checked and took photos of the fuel prices at Cameron Corner, Innaminka and Birdsville expecting one of them to be the most expensive. However, I was surprised when Peter told me the prices at Gemtree, a town about 140km from Alice Springs (bitumen all the way) were $2.01 for unleaded and $2.06 for diesel. I never bothered to check or take a photo because I did not expect this high price. The manager at Innaminka told me that the hotels at Innaminka and Birdsville are owned by the same person and business is booming. A new fancy restaurant is being constructed at Innaminka. On some days they serve over 200 meals at Innaminka and Birdsville. The motel at Birdsville is booked solid until October 2008. During peak periods up to 4 coaches per week visit these towns. They day we left, Birdsville was expecting 27 helicopters and some coaches with 94 people staying. In Broken Hill, Greg was walking down the street wearing a floral shirt when a passer-by made a rude comment to him. We made good fun of that comment during the trip and Greg played along. He should never have mentioned it. At Birdsville, I noticed that there was a marked school crossing on the road outside the school. I wonder if they have a lollypop lady given the large number of vehicles that pass the school? When the gas ran out whilst cooking a BBQ lunch in the park BBQ at Hay. Didn't matter because Angie had a backup plan to use the local Hotel facilities which we did. The door magnetic cards not working on our first night at Wagga Wagga. My mobile ringing whilst we were watching a DVD at Rio Vista house in Mildura. Not getting to the sculptures at Broken Hill before sunset. Apparently, some of the sculptures utilise the setting sun for special effects. When we arrived there were lots of people there. Some had tripods set up to capture these special effects. I suspect you would need to get there very early to reserve your photographic place. The power failure in the Tibooburra dining room at breakfast. Satellite telephone not working when we broke down about 2 hrs out of Birdsville. It didn't really matter because the coach also had a CB radio which all the locals use (and is probably better). Lurline breaking the water tap in the toilets at the Birdsville racetrack. Water was spraying everywhere. Ann tried to fix it but couldn't. Dorothy was in the toilet at the time and could hear the sudden rush of water and yelling so she made a fast exit. Her only concern was that she had not put the toilet lid down as the sign requests you do. This photo is a bit like what the water looked like. I turned the tap off at the water tank suppling the toilets and Peter and Greg fixed the tap and turned the water back on. At least the toilets got a good clean. During the tour we crossed the borders between 4 States a few times. With this came different time zones. 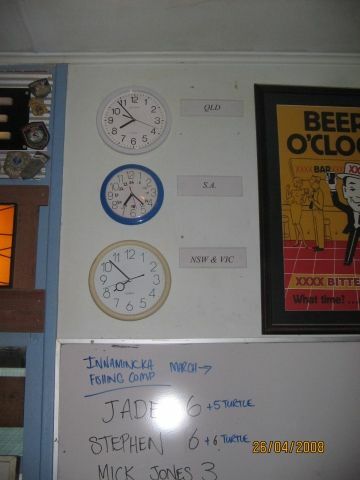 This always created confusion in deciding which time to use for meeting at places and whether to move clocks backwards or forwards. To add to the confusion, Broken Hill (which is in NSW) uses Adelaide time. 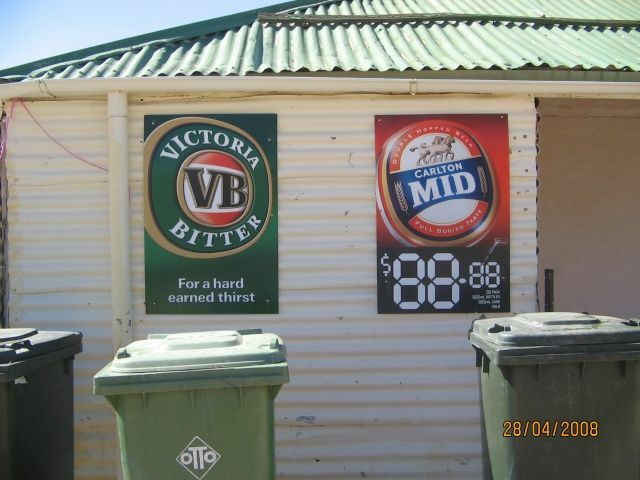 I took this photo in the Innamincka hotel which should help Peter and Angie on future trips. If my mobile phone can automatically change time zones (when in range), then the sophisticated Outback Spirit coach should have the console clock connected to the Satellite telephone (which should be always in range [when it works]) and automatically change time zones. Which floor is the 1st Floor?. At the Pavilion Hotel in Wagga Wagga, it was the floor at ground level which in Australia is usually called the Ground Floor. Our tour guide at the Alice Springs Telegraph Station was Muriel who got sucked into some entertaining quips with Herb. We had a good laugh. She even commented that this was the best fun she ever had with a tour group. Fortunately, it was not anyone on our tour but the elderly lady we ran into at the Hotel in Mildura. We first saw her at the reception desk when we arrived. She was complaining about the quality of the wine in her room and that she was not going to pay for it. Another time she was near Greg and poked him in the stomach retorting "and you need to lose weight". Ann said "Good Morning" to her and she retorted "Its a terrible morning - the guy is 30 mins late picking me up". We last saw her sitting outside the Hotel waiting for someone to pick her up for a day tour to Mungo Lake National Park. The poor tour guide was in for a hard day. Of Birdsville? I asked at the Caravan Park, the Service Station, The Museum and other places. It varied from 60 to 120. We have travelled with Outback Spirit a few times before and I noticed a few improvements on this brand new vehicle. The window curtains are now pull down translucent blinds whereas previously they were pull across blackout curtains. The road cam monitor is bigger and brighter and the camera at the front has a wider viewing angle. Peter added a slice of lemon to the water carried on the bus. 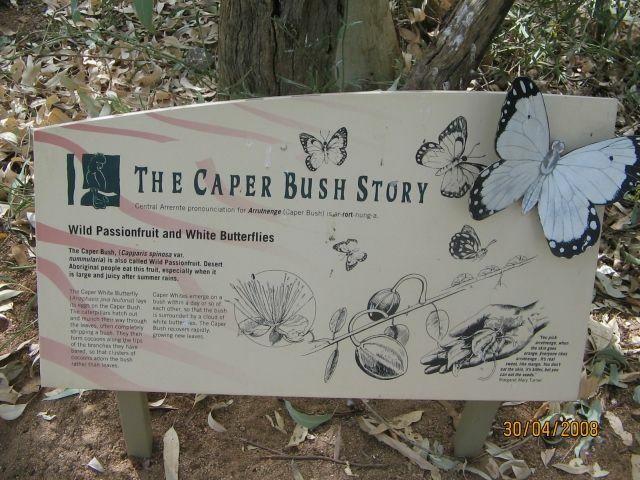 We never saw any butterflies on the trip but we did see this information placard at the Desert Park in Alice Springs. At Silverton. They had crossed off some staple items from the menu. See this photo. No dinners were exceptional but the main course of beef ribs at the Birdsville Hotel was the best beef I have tasted. Apparently, it was "eco" beef grown locally. Hank. There is hardly a country that he has not visited or lived in. Herb and Pam have also travelled extensively. That most of the historic outback hotels are not the original structures. Most burnt down last century. However, when they rebuilt, some part of the original structures were incorporated into the new buildings. The condition of cattle in the outback. Most looked reasonably healthy. 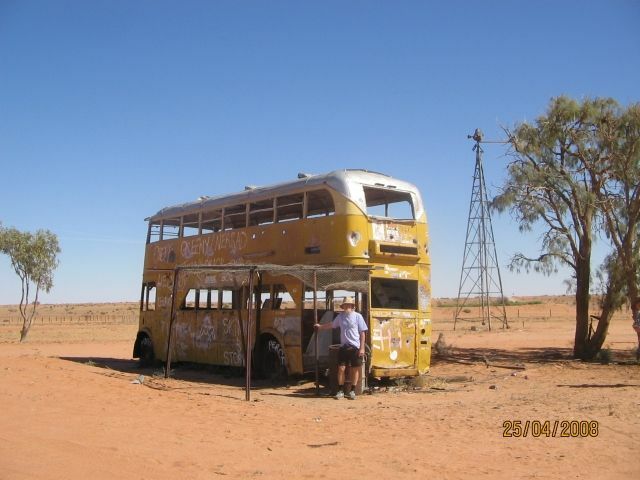 This was confirmed by the people from Cordillo Station who stopped to help us when the bus broke down. The Motels we stayed in at Innaminka and Birdsville were as good as any in major cities. The level ground and canals from previous irrigated rice growing around Hay from the Murrumbidgee River. It was more extensive then I expected. In Boulia we had to leave very early next morning to travel to Alice. The group was split between the Desert Sands Motel and the Hotel and it was organised that we have continental breakfast in our rooms. Those that stayed in at the Hotel had an inadequate meagre breakfast. Noticed sun blocking sails over some of the outdoor car parking at Coles in Mildura. 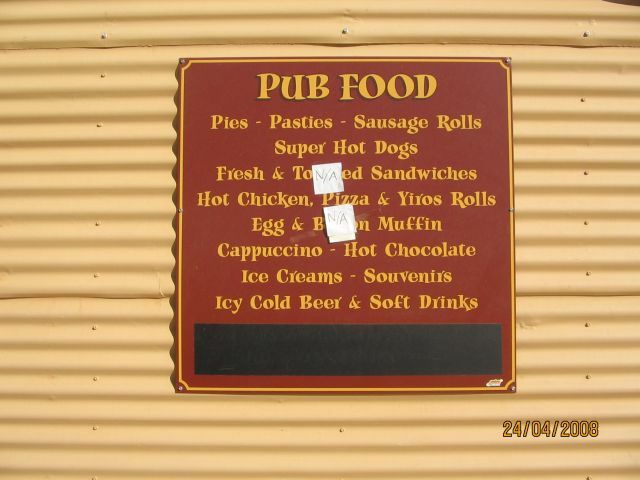 In Mildura saw this sign at the drive-in grog shop under the Hotel we stayed in "Mildura first - EFTPOS to your car". They get excited about important things in the country. In Broken Hill the early morning street cleaners were meticulously soaping, scrubbing and rinsing the rubbish bin holders along the street. Wagga Wagga is the home of the Chicko Roll (about 1935). There is a golf course at Cameron Corner. Peter pointed it out to me. They used buried buckets for the holes. In Alice Springs a "Kiss n Go" drop off zone outside a school. Some of the evening meals we had were a bit strange. You got a choice - well sort of. For example, main course would have three different meals but you got what was served. If you did not like that meal you could swap with someone else. This happened at Wagga Wagga and Birdsville. Hank had never seen this before in all his travels. At Jervois. A small stop between Boulia and Alice Springs. Just about everyone on the coach bought one. See this photo of the queue. At $2.50 each they made enough money to run their diesel generator for 1 hour. The morning we left Broken Hill a guy hassled us whilst we were loading our bags onto the bus. He wanted to know why the tour had not visited the "biggest painting in the world (or maybe that was Australia)". 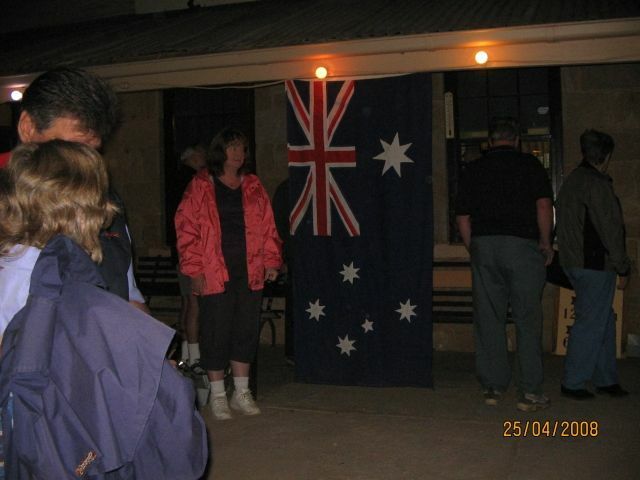 We attended the dawn service out front of the Hotel at Tibooburra with a few locals who later cooked breakfast for us. My first dawn service and it was very moving. Later, Angie kindly provided us with a large tin of ANZAC biscuits which we consumed in the forthcoming morning and arvo teas. See this photo of Ann at the dawn service. Who won at the Birdsville Races? A dead heat between Ann and Lurline. Click here for the photo finish. A double decker bus dumped about 50 km from Cameron Corner. When we walked around the front of the bus, Alan pointed out that it had been towed there, not driven, because it had a towbar coupling arrangement sticking out the front. Click here for photo of me beside the bus. A sign with shoes all over it. Click here for photo. Lots of willy-willies. I counted at least 10. Most were small but one extended about 200 Metres into the air. They seem to appear in the more desolate areas. At Bedourie, a town halfway between Birdsville and Boulia. $88.88 for a slab. Click here for photo. Greg told me that this is over twice the price you would pay in Sydney. 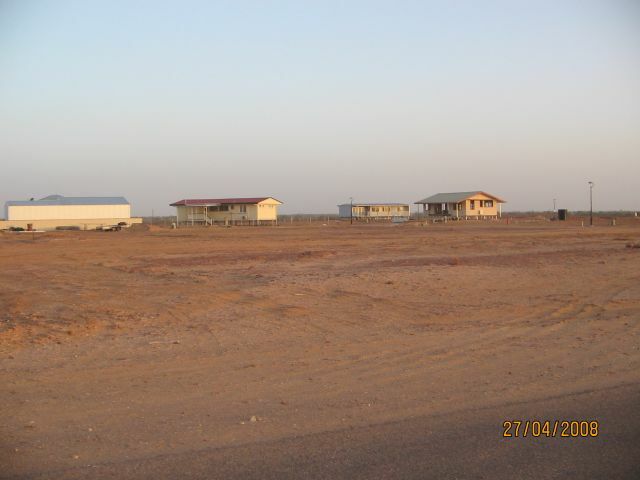 The new estate at Birdsville. I gave it this name because there was no sign telling you about the estate. It was very modern even having underground power. The three or so houses there were all on stilts. Click here for photo. All the locals I spoke to thought the developers were mad but maybe the developers know something the locals don't. Dorothy suggested the bus carry a bush to hide behind when going to the toilet. Rather than 2 days in Mildura it would have been better to spend 2 days in Broken Hill. 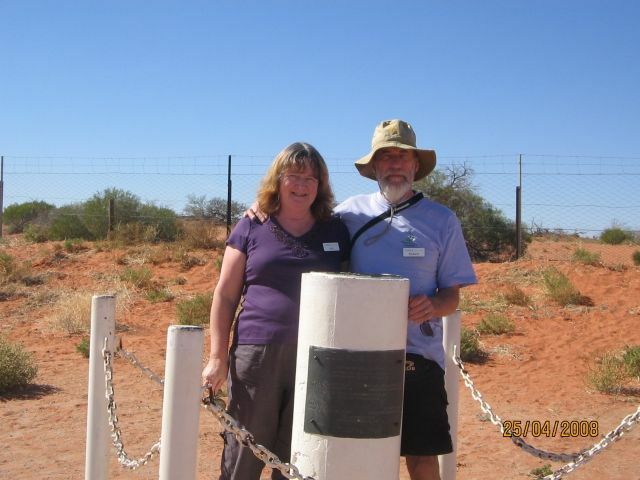 We could then have had an extended visit to the Mungo National Park rather than the cursory visit we had. We were each given a drinking mug to use for the duration of the trip. These should be Outback Spirit souvenir mugs that we get to keep at the end of the trip. 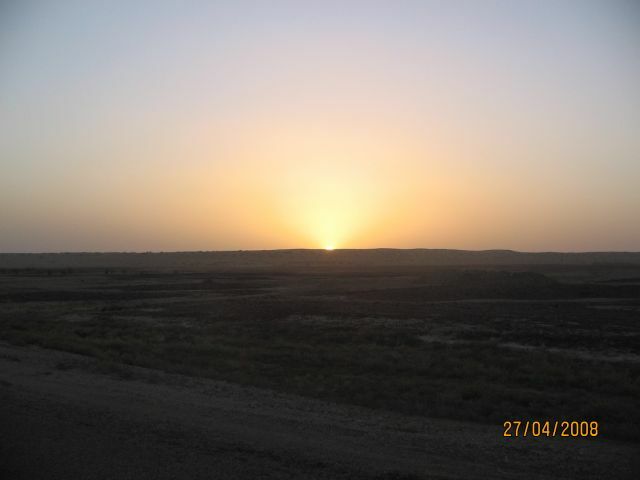 Sunrise and sunset in the outback where you can see the 360 deg horizon. You cannot photograph it and it is difficult to explain the visual experience but it is magical. The glow spreads around the horizon like an aura. We all viewed sunrise in the coach when we left Boulia before sunrise driving towards Alice Springs. At Birdsville, just before dinner, Ann and I decided to walk out and photograph a large sign about 2 km out of town. Took about 40 mins to walk there and back. Luckily, we observed the sunset just after we photographed the sign. This photo gives you an idea of what it looked like. We have seen the spectacular ocean sunset at Broome but I believe the outback one is better. Wagga Wagga. As soon as we drove into the town I noticed the clean, wide and well manicured streets. Shop signs were bright and visible. Apparently, this is attributed to the multi generational pride in the town. Bedourie was also a nice looking town. They have spent a lot of money there on facilities even though the population is small. Brenda and Judy. 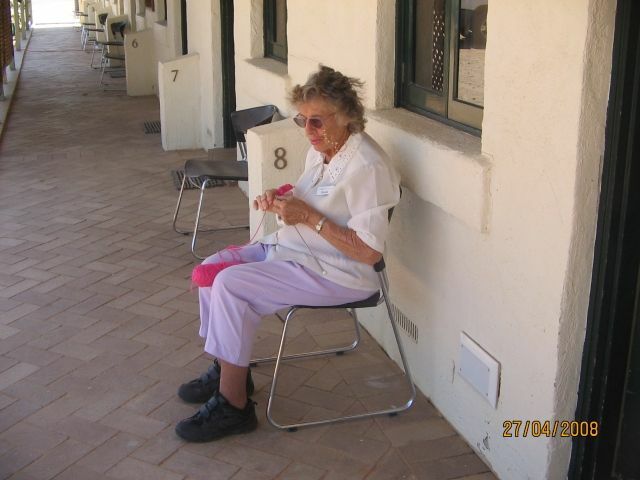 See this photo of Brenda taken at the Birdsville Hotel. Judy knitted on the bus. Soon after we left Sydney it was discovered that the hot water system for drinks had a leak and was not functioning correctly. This did not stop the bus from operating. The door catch had a sharp edge on it and a few people got scratched whilst getting out. Peter filed the sharp edges off. About 2 hrs from Birdsville, a low water alarm sounded. Lifting the cabin revealed that a hose connection on the bottom of the header tank had worked loose. Took about 1 hr to detect and fix. 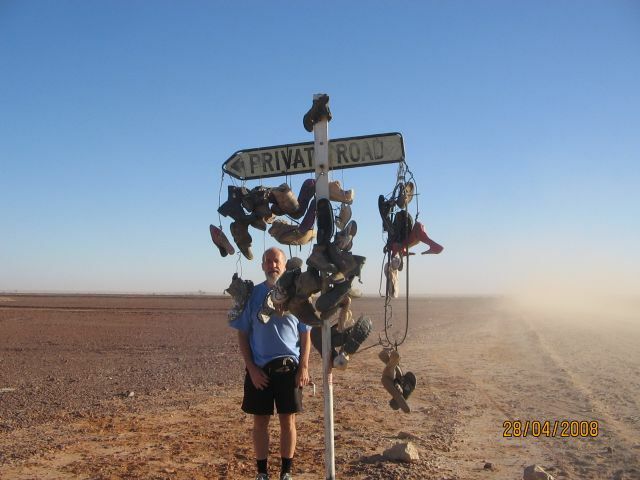 After the above event, Peter used the Satellite telephone to call the Birdsville Hotel and advise that we would be late. However, Peter could hear them but they could not hear Peter. I suspect the Satellite telephone problem was not resolved because Peter and Angie used public telephones for the rest of the tour related calls. About 1 hr out of Bedourie, the belt driving the air conditioning compressor broke. Took about 20 mins to replace. Whist we were fixing the coach after breaking down about 2 hrs from Birdsville, a vehicle from the local Cordillo Downs station stopped to offer their help. Even after we found the problem, they would not leave until they were absolutely sure we would be OK. They even left details of their CB radio channel if we needed any further help. They also provided the current AFL football score to those interested. The old Truss bridge at Wagga Wagga. Closed in 1993 after over 100 years of service. The old lift Span bridge at Mildura. Nor used any more but incorporated as a feature into a new estate. The curved ballroom floor in the basement of the Rio Vista house in Mildura. The replicated ships mast and covering over the dining room in the Hotel at Wagga Wagga. Dorothy at 82 and Greg at 56. On the toilet seats in the toilet at the Birdsville race track. Ann told me the dust was about 50mm thick over the top. There was a sign asking you to please put the lid down after finishing. The ones Peter had to brake hard and swerve to miss coming into Birdsville. An earlier breakdown held us up so we were driving after dark which is not desirable. Many of the outback towns had an obsession with Apple Crumble for dessert. At Tibooburra it was terrible but at Alice Springs it was nice except they called it Apple Crisp. Innaminka. After traversing the Strzelecki Track with its dust, corrugations and desolate landscape we drove through Innaminka and stopped at the Cooper Creek about 200 Metres past the town. The water was flowing strongly (you could hear it gurgling) and there were lots of trees full of very noisy birds. Click here for photo. It was like walking into a different world. 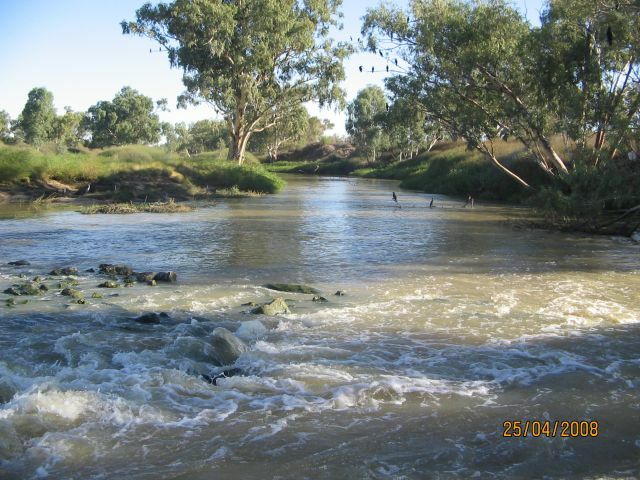 In contrast, the Darling River near Menindee (click here for photo) and the Diamantina near Birdsville were both drab and lifeless. 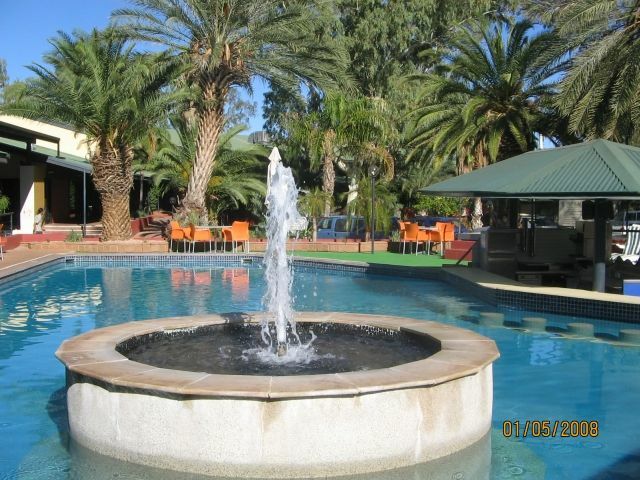 Alice Springs Resort at $7.50. At Innaminka and Birdsville they served soup and dessert in chipped enamelled mugs and the main meal on chipped enamelled plates. I asked the waitress why and she said that it is very difficult to transport china plates because they break in transit over the rough roads. Also, kitchen accidents break china plates. Nevertheless, they are obtaining china plates soon. I think they should continue using enamelled plates. It adds to the character of the place. Her bed at the end of each day and me beside her. The Desert Park at Alice Springs. Its theme fitted the area and it was extremely interesting. I was also impressed by the young man in a wheelchair handing out the audio guides. He was stricken with spina bifida but that did not stop him doing an excellent job. 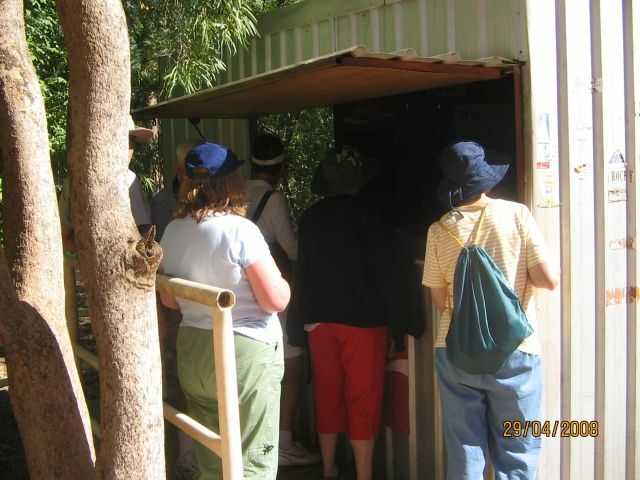 The Working Museum at Birdsville was also very good but it could have been located anywhere. I was so impressed I purchased a couple of their DVD's. "Working" means that the owner shows you how some of the old pieces worked and he swapped between pieces at a very fast pace. The Min Min centre at Boulia. It was very sophisticated and played on the tale of the mystical Min Min light. A bit dragged out and at a cost of $1.8 Million I thought it was overrated. I expected the Min Min light at the end to be a hologram that flew around the room. 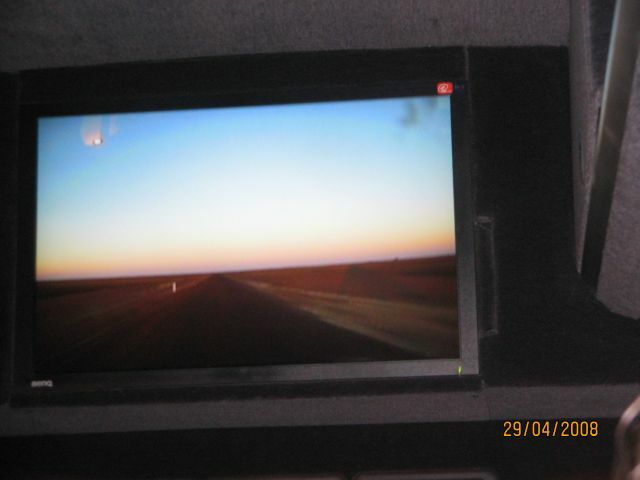 Having said that, the next morning whilst driving out of Boulia, someone noticed a light in the bus road cam and suggested it might be the Min Min light. See this photo. The light is in the top LH corner. Menindee. It looked like a shanty town. Name the 4 places in Australia where the borders of 3 States meet. Cameron Corner. SA, QLD and NSW. We went there and it was not that exciting. A large steel pole marking the corner and 3 smaller poles marking the borders. See this photo. Poeppel Corner. NT, QLD and SA. Surveyor Generals Corner. WA, NT and SA. SA, NSW and VIC meeting does not have a name. 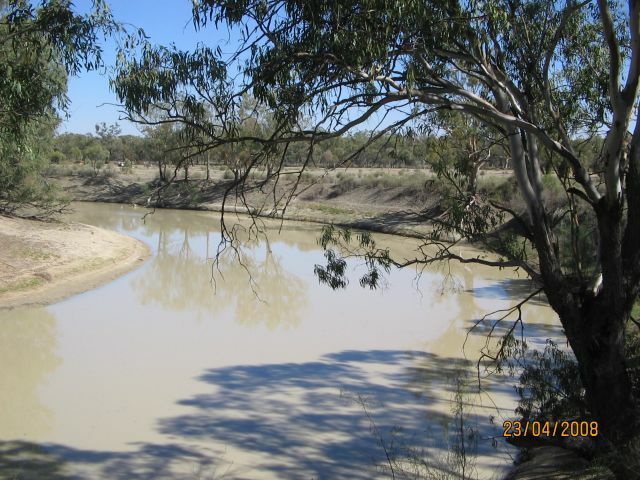 The border of NSW/SA at the Murray does not directly meet the border of VIC/SA at the Murray. The NSW/SA border is 3.6 km East of the NSW/SA border at the Murray. In the shop at Shear Outback in Hay an older guy working in the shop came up to me and asked "How much did you pay for your shoes?" Initially, I was taken aback but he went on to explain that he once sold the type of shoes I was wearing and was interested in what I payed for them. The flies at lunch stops near Innaminka and Birdsville. 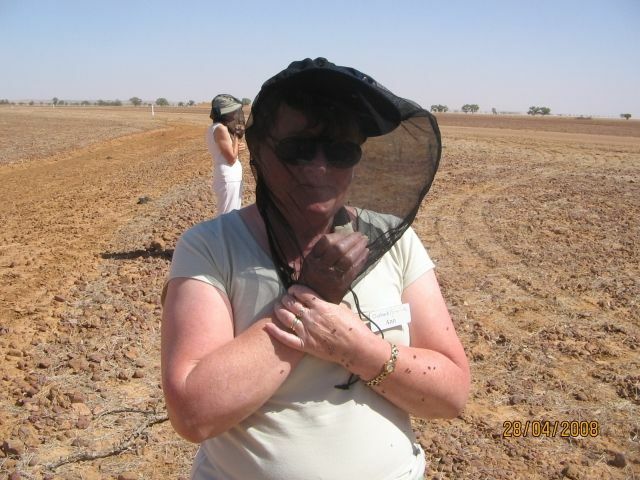 A head net was essential. See this photo of Ann. It is hard to believe that since Burke and Wills made their voyage the dig tree has not died, washed away in floods or been souvenired. Sidney Kidman was one of Australia's greatest pastoral landholders and in the book about him by Jill Bowmen, Kidman admits to souveniring a part of the tree. How many others have done this? Peter (Driver) mentioned that there is some discussion between experts about the format of the writing on the dig tree regarding the use of Roman Numerals by Burke. Sandwiches at the Royal Flying Doctor Service in Alice Springs. The lunches we had on the road were also good. Judy was ill whilst we were in Mildura but recovered in a few days. Neville at the dawn service at Tibooburra singing Advance Australia Fair. And he knew the words! Angie when reading some tour notes. She would start reading and halfway through a sentence stop and then resume up to 30 secs later. This was quite annoying at times but she got much better towards the end of the trip. Diesel fuel at Innaminka. The Manager of the Innaminka Hotel told me it costs $21,000/Month for fuel to run their generator. However, by early 2009, they hope to be supplied with electricity from a Geo Thermal station near the Moomba gas and oil fields. 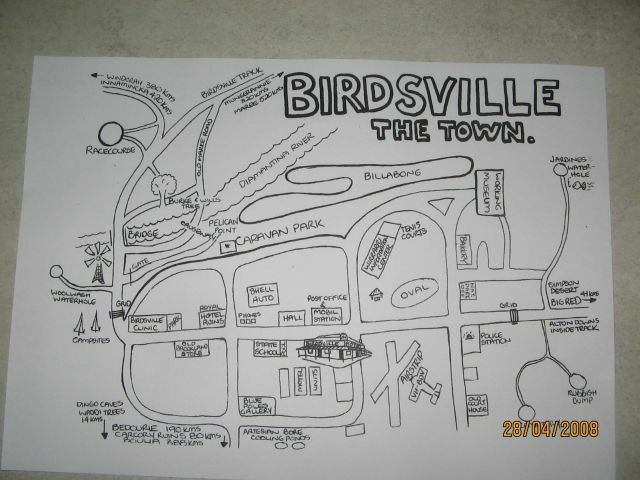 In the Birdsville Motel information pack there was a sheet of paper with an interesting map of the town. It was similar to one in the brochure I got from Innaminka. I asked at the reception desk if they had any copies I could have but they did not. The pack had a warning that if you remove any sheets from the pack you will be charged $50 so I took this photo. The pools at the Hotel in Mildura and Alice Springs. Boulia to Birdsville. It was terrible in places. Nearly as bad as the Tanami Track which we traversed a few years ago. Our average speed in the coach along that section was 68 km/Hr. This includes the last 140 km of bitumen. During our brief stop in Balranald we discovered that there is a very large frog population in the wetlands around there. 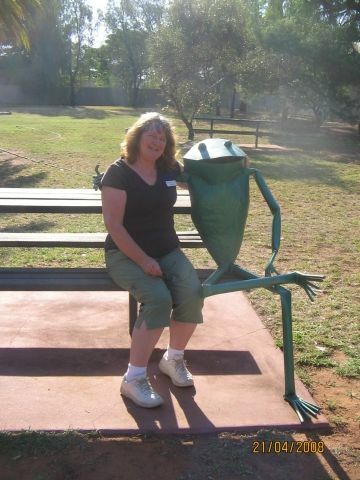 I found one of the frogs and took this photo with Ann. "I am going to visit the locals" translates to "I am going to have a beer". The Grand Hotel in Mildura. After a swim in their pool I used the spa and then the shower near the spa. To my annoyance, the handle fell off the cold water tap so I had to use the shower in our room. Alice Springs. They have no water restrictions and the shower rose was huge with enormous pressure. Nearly blew me out of the shower. The Pavilion Hotel in Wagga Wagga. Could have fitted 10 people in it. Herb is a retired property developer and he told me a few times to "never become attached to real estate". He gave me a business card at the end of the trip but it did not have his motto printed on it. I suspect it was Nancy although I never observed her sleeping. She told me the story about Ron suffering from sleep apnea and forgetting to bring a vital component for his sleep apnea machine and that she did not get much sleep during the night. We noticed Herbert streets in 2 outback towns. Then later we passed Herbert Downs Station and in Alice there is a Herbert Heritage Drive. He was very excited. At Innaminka they are building a new restaurant. Someone on our bus asked them if they had any window glass broken in transit from wherever to Innaminka (the roads are terrible). No, they replied but when the forklift driver was unloading the windows at Innaminka he broke some glass. Had to wait another month for new glass. Films: We of the Never Never, The Back of Beyond (a tribute to Birdsville Track mailman Tom Kruse). Books: We of the Never Never, Mailman of the Birdsville Track (the story of Tom Kruse), Kidman the Forgotten King (the story of Sidney Kidman, the greatest Australian pastoral landholder in modern history). To all the tour participants for many interesting and entertaining discussions. As Hank said, you should leave the tour having learnt at least one new thing from each person. Ann would like to particularly thank Lurline and Dorothy for the entertainment at the Birdsville Races. They had many laughs about it later. It was better than I expected. 4 out of 5 Stars.